This article is about a railroad tunnel in New York City. For tunnels to freedom, see Escape tunnel. The tunnel was built by Robert Moses in the 1930s to expand park space for Upper West Side residents – although the construction of Moses's Henry Hudson Parkway in the same area effectively blocked access to the river. After it was completed, the tunnel was used for freight trains until 1980, when regular operations ended. The railroad favored using yards in the Bronx and New Jersey, and increased use of trucking led to the demise of the West Side Line. The giant, man-made caverns became a haven for homeless people. At its height in 1994, nearly a hundred people lived in the tunnel. On April 4, 1991, the tunnel was reopened for trains of the Amtrak Empire Connection, and a massive eviction followed. The shantytowns were bulldozed and the tunnel was chained off. 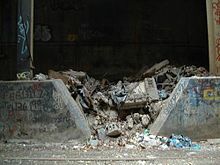 To this day, however, graffiti artists and urban explorers continue to visit the tunnel, while the homeless population has been mostly displaced. Around 2014 and 2015, graffiti artists and urban explorers were sporadically caught and escorted out by Amtrak Police. Over the tunnel's years of disuse, its isolated nature allowed graffiti artists and street artists to work without fear of arrest, leading to larger and more ambitious pieces. The tunnel has unique lighting provided by grates in the sidewalks of Riverside Park above the space. 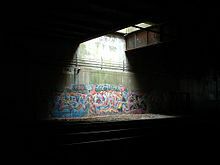 The descending shafts of light allow graffiti art to be seen in the gloom, and artists would often center their projects under the light to take advantage of the spot-lighting effect, as if in a gallery. 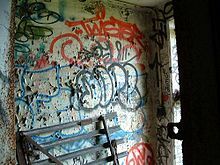 After achieving popularity in the book Spraycan art by James Prigoff and Henry Chalfant, graffiti artists began to flock to the Freedom Tunnel and gained access through a series of broken gates near 103rd Street and Riverside Park. Early artists who left their mark on the tunnel included Smith and his brother Sane (who died in 1991), Ghost, Twist, Dan Plasma, Cost, and Revs. Until the construction of the Trump Riverside development, the south end of the tunnel terminated in a large open area. In the 1980s and 1990s, a tent city with pirated electricity and hundreds, perhaps thousands of dwellers existed in the south end of the tunnel. Retired trains were also permanently parked near the south end of the tunnel allowing artists to cover whole cars with paint and murals, even if the cars themselves never left the tunnels. However, the homeless population was gradually relocated from the tunnel to other places. "Freedom" dedicated one of the tunnel's murals to the former homeless population there. Works by "Freedom" remained mostly untouched and respected by taggers. A notable exception was the recreation of Francisco Goya's The Third of May, which was defaced, but subsequently restored by Freedom. In addition, there are numerous other murals on the walls in the 90- and 100-block areas of the tunnel; including a chiaroscuro style study of the Venus de Milo, and original portraits rendered with impressionistic splashes of color. The centerpiece of the tunnel is a mural painted in the style of a comic book that tells an abstract story that seems to reference the relationship of the former residents of the tunnel, the city, and the police. Other historical pieces range from Michelangelo to Norman Rockwell. Beginning on the fall of 2009, Amtrak began to aggressively repaint the tunnels in an effort to restore their original appearance. Nearly all of the tunnel's interior walls south of 91st street were repainted, resulting in many murals disappearing, including the centerpiece mural by Freedom and Smith commemorating the former residents of the tunnel. For unknown reasons, Amtrak did not finish repainting the tunnel walls north of 91st street. Today, all of the walls that were repainted have been covered by new layers of graffiti. Around 2010, the Third of May mural suffered a great deal of water damage due to a leak in the tunnel directly above. Jennifer Toth documents the homeless residents in her book The Mole People (1993). Photographer Margaret Morton made the photo book The Tunnel (1995). Marc Singer made the documentary Dark Days (2000) about the tunnel, using footage shot in the mid-1990s. Singer's later visit to the tunnel in 2011 is included in the film's 10th anniversary DVD release. Anthropologist and journalist Teun Voeten wrote the very detailed Tunnel People (2010). Explorer and writers Moses Gates describes his multiple encounters with other urban explorers and homeless people including one who resided in the tunnel for over thirty years in his book Hidden Cities (2013). ^ "Amtrak "Freedom" Tunnel". industrialnewyork.com. Archived from the original on December 8, 2008. Retrieved September 19, 2015. ^ Mind Tracks: Modern Urban Undergrounds in Life, Literature, and Art Chapter 10. 2004. Retrieved July 25, 2013. ^ Voeten, Teun (2010). Tunnel People. Oakland, CA: PM press. pp. 320, includes one map and one 16-page b&w photo insert. ISBN 978-1-60486-070-2. ^ Morton, Margaret (October 7, 1995). "Homes for the Invisible". The New York Times. Retrieved September 19, 2015. ^ "Public-Safety Steps Are Still Incomplete On New Train Route". The New York Times. April 8, 1991. Retrieved July 2, 2010. ^ "LTV Squad- Freedom Tunnel". LTVSquad. Retrieved September 24, 2017. ^ a b "Riverside Park Tunnel - 2009". All City New York. Retrieved February 18, 2009. ^ "Exploring an Active Amtrak Tunnel Under the Upper West Side". Curbed NY. Retrieved September 19, 2015. ^ a b "The Freedom Tunnel— A Haven For Urban Art - NYU Local". NYU Local. Retrieved September 19, 2015. ^ "Student Trespassing". We are All Criminals. Retrieved September 19, 2015. ^ a b "NYC Underground: A Journey To The Freedom Tunnel". Retrieved August 7, 2012. ^ "Freedom No More". Adventure Two. Retrieved December 1, 2010. ^ "Riverside Park Tunnel - 2010". All City New York. Retrieved August 16, 2010. Wikimedia Commons has media related to Freedom Tunnel.